This is an open call for filmmakers everywhere to make more movies starting with the letter X. The reason why should be clear: here I am watching goddamn Xtro 3. 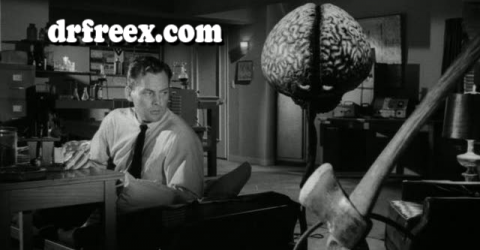 Back during another A-Z challenge (off-season, as it were), I watched the original Xtro. I didn’t care for it, but it did have some creative ideas that set it apart from other cash-in-on-E.T. movies. 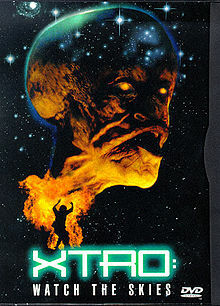 Last year I watched Xtro 2, which was remarkable only for the number of movies it managed to rip off. So here we are, this year, with the inevitability of a doomed character trapped in a hidebound franchise, with Xtro 3: Watch the Skies. The first thing you need to know is that a spaceship crashed on Earth in 1955 in a welter of poor video-generated effects. This was covered up by the government, because that is what they do. This is relayed in a tongue-and-cheek 50s newsreel that wants to be cuter than it is. In the present of 1995, a man meets with a reporter in a low-rent motel, and he tells her the tale that will grind away our next 90 minutes. 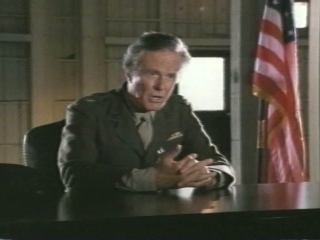 He is Marine demolitions expert Kirn (Sal Landi), who receives orders from his commander (Robert Culp, who hopefully made his mortgage payment off this) to head up a hand-picked crew that will go to an island 200 miles off the coast to blow up some leftover WWII ordnance so an airfield can be built there. This is fine with Kirn, as he wants to “get out of the classroom”, but he recognizes the “hand-picked crew” from his classes; they are all losers, discipline problems, and “borderline psychos”. 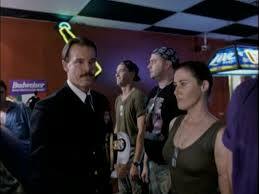 You might immediately suspect that all these soldiers might as well have EXPENDABLE stamped on their dogtags, and you will proven right when the guy in charge of the operations shows up, a beret-bedecked spook named Fetterman (Andrew Divoff), who tells the crew that there was also an internment camp there, so any documents they might find are classified and should be taken directly to him. You are now going Hmmmm enough that you might as well be humming a happy song culled from other movies you have seen. One detonated bomb uncovers a concrete structure. In the course of the movie, we will find out that this is where the gummint brought the spaceship, and the two aliens inside. They vivisected one alien in full view of the other, and the remaining alien got pissed off, broke out, and proceeded to slaughter everybody. The authorities had to wait until it went back into the ship and poured concrete around it to trap it. Or so the one wild man who’s been on the island for 40 years tells in a moment of lucidity. 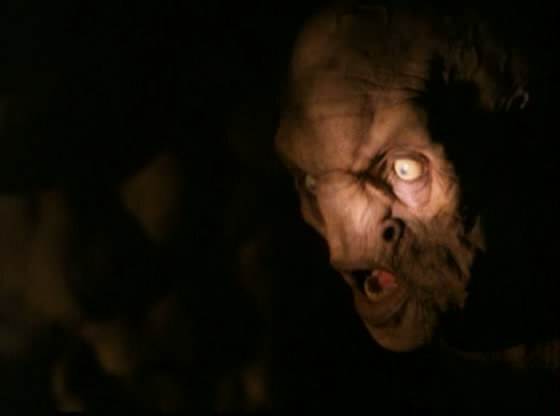 Well, now that one stoned soldier blew a hole in the structure, the alien is loose again, and quite possibly insane, as it seems to want to constantly re-enact the vivisection of its (presumed) mate on whoever is unlucky enough to be around. This all sounds like a pretty good movie, and it’s certainly better than Xtro 2. It almost succeeds in forging its own identity, but then director Harry Bromley Davenport (who directed all three of these) still has to go to the rip-off well again. The Alien can camouflage itself like the Predator. And a healthy dose of exposition is delivered by an Alien Autopsy style film reel kept by that survivor (luckily, he also kept the movie projector in good working order). So much of Xtro 3 is poorly thought out or executed that you feel bad about it constantly shooting itself in the foot. Was the alien also trapped in the concrete, or just the ship? I can accept the characters being confused on that point, but that concrete structure is large and square – an explosion big enough to uncover it would do more than blow a hole in a corner. And accepting that our two Marines just didn’t notice a square bunker in a bunch of rock outcroppings is a bit much to handle, even if one of them is supposedly stoned to the gills. Sequences that should be nerve-wracking are hampered by insane logic whose only purpose is to draw out the running time. And yes, this is another instance of my constantly tracking the time remaining as I watched. Even the Alien is given to the same fitful treatment; there are times it looks remarkably alive, and menacing; most of the time however, it looks and moves exactly like the puppet it is. As I said: it is at least better than Xtro 2, but that was a bar set so low, it was resting on the ground. Too bad you reviewed X the Unknown in the days of the Bad Movie Report. TELL me about it! WHAT WAS I THINKING?!? !